Note from the editor: I've asked a few alumni to give us updates on what they're doing now. William graduated in 2013, and will be our first contributor in this series. Since my last post on the West Dean blog (nearly two years ago now!) I've transitioned from a contract position working on a digitization project for e-learning company Gale Cengage to a permanent position at the Smithsonian Institution Archives (SIA). SIA's collections span the history of the Smithsonian, including original accession records of the various objects that now fill the 19 different museums (plus nine research centers and a zoo), personal and professional correspondence of the scientists and curators who have worked here, photographs documenting research expeditions and catalogued specimens, and architectural plans demonstrating the growth of the Smithsonian from just one building, the Castle, into the various edifices it now inhabits. All this is to say that the collections we deal with in the conservation lab on a regular basis are varied, to say the least. Here I'll share a few highlights from collections I've recently worked on to give a taste of what's here. These photographic crayon enlargements, associated with William Temple Hornaday (founder of the National Zoo) were made on sensitized paper that was then adhered to a stretched linen "canvas". 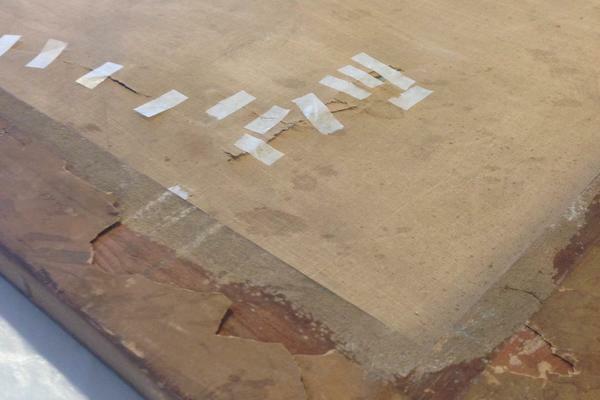 They were first removed from the stretchers by carefully working the linen out from under the rusted nails holding it in place and then lifting away the wooden frame. Tears in the enlargement were stabilized with a heat-set tissue I prepared with the acrylic adhesive Plextol B500, that has sufficient tack to be supportive and that flowed nicely into the weave of the linen, while still easily reversible. 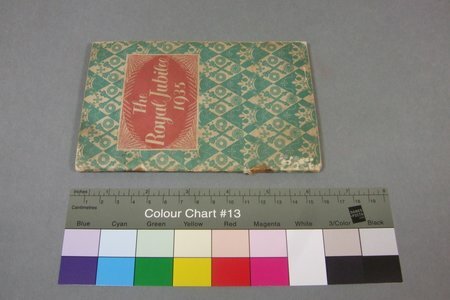 The mended enlargements were then mounted on backing boards with Japanese paper strips that attached to the back of the image and then wrapped around to the rear of the backing board. 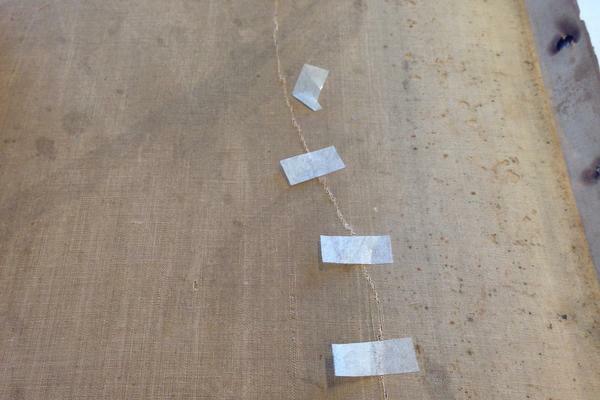 Detaching areas of the paper across the objects were then gently tacked into place with Lascaux adhesive films. One of the crayon enlargements prior to removing the wooden stretcher. Verso of a dismounted enlargement, with the temporary heat-set tissue “staples” across a tear in the foreground, while similar mends have been replaced with a contoured support piece in the background. Detail of the recto of an enlargement, showing the mounting technique at lower left. Recently the Archives accessioned papers from the family of Charles D. Walcott, fourth Secretary of the Smithsonian, famous for his panoramic photographs of the Canadian Rockies. The papers included this 1740 indenture or contract that describes a property transaction in New York Colony between a Dutch couple and a widow. 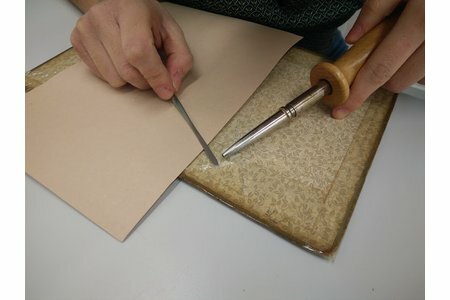 The document had been folded and despite losses to the paper along those folds, the wax seals remained intact. After locally humidifying the indenture to relax the folds, tears were mended with a thin, almost transparent tissue, while fills were made from a sympathetic Western paper shaped precisely to fit the lacunae and held in place by a backing of the same thin tissue. 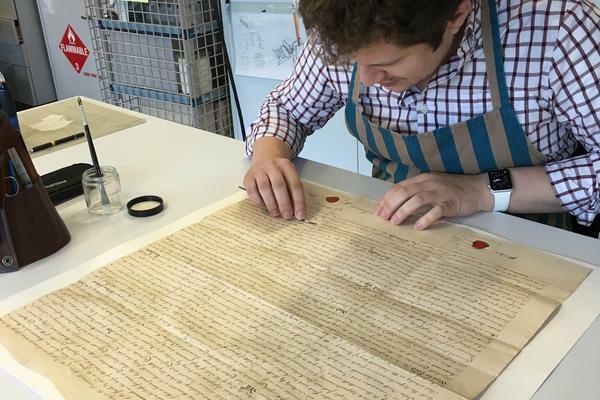 William checking the adhesion of paper fills to the document. 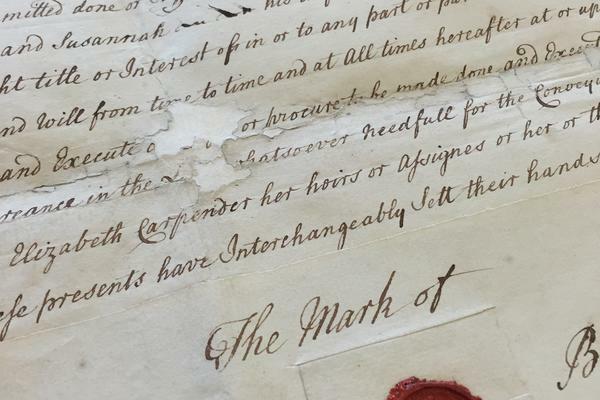 Detail of the indenture following treatment. 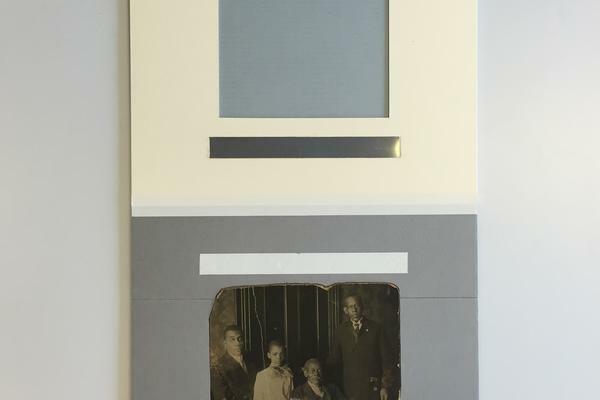 The first African American employee of the Smithsonian, Solomon Brown, left a rich legacy in his community, and a descendant recently donated a photograph of some of his relatives to SIA. The image was broken in half, its backing was badly deteriorated, and the board was deformed. To protect the photograph and provide access for researchers, I designed a custom magnetic mount with a base that slides apart to allow the object to be removed without abrading the edges, with a magnetic window over-mat that gently restrains the curling edges as well as a protective cover mat. You can read more about how it works on the SIA blog post I wrote last autumn. Completed custom housing for the historical photograph. 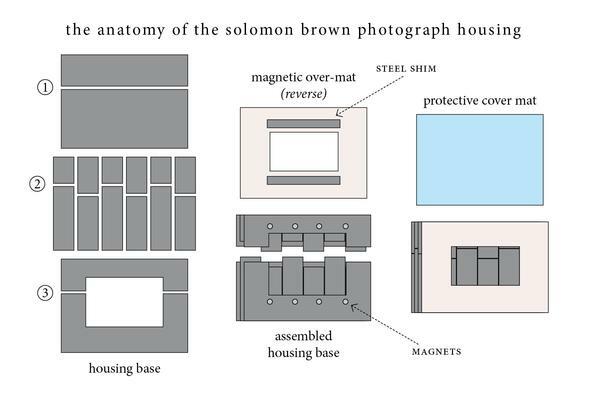 Diagram of the photograph housing construction, showing the three components. In addition to working on our own conservation projects, SIA also participates in pan-institutional efforts, including the Field Book Project which catalogs, conserves, and digitizes field books from across the Smithsonian. 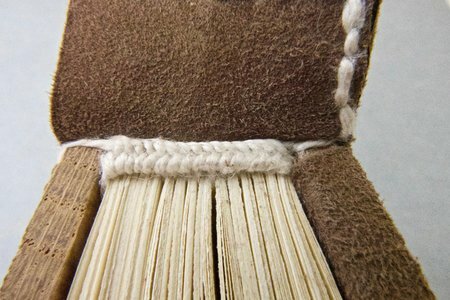 Many of these books contain specimens which require proper mounting to be preserved as part of the record. Most are botanical specimens, but some are animal, including a complete snakeskin found a few years ago! Drawing from these as examples, I recently prepared a set of mounts for some flora I found tucked inside a set of diaries from the late 1940s and early 1950s. 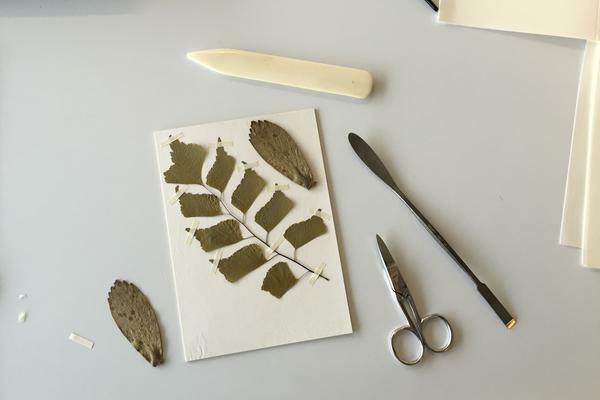 The specimens were mounted using thin strips of Japanese paper tacked in place with dry wheat starch paste. As you can see, it's rarely a dull day on the job! It is a fascinating and enriching experience. 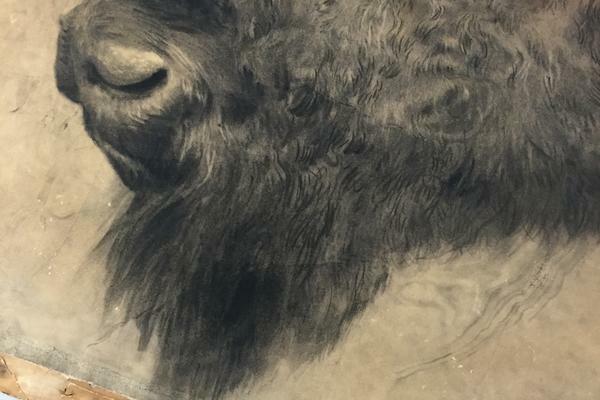 You can see more of what our staff is working on via our blog and social media accounts (Facebook and Twitter), and explore more of our collections on the SIA website.